« Eight Years of Eating: Still Typing and Typoing Along. Oddly, I’ve never written much about Villa Nova. I checked the Gourmand archives and found this post about “Big Beers” in their bar back in 2006. And a brief mention, while I was exploring the pizza options of Clintonville. For a restaurant that could best be described as a powerhouse of North Columbus that is a major oversight on my part. For many years, Villa Nova was one of few restaurant options between Clintonville and Worthington. Frank and Donna Colleli started the place in 1978, converting a bar into a restaurant with a bar. As you can see from my linked post above – the bar business never suffered. The family had also operated Franco’s Pizza just down the street (another area icon). The place quickly became a cash cow so Frank sold the business and moved to Florida in 1986. His son John, convinced his Frank come home and buy back the restaurant in 1998. The restaurant has never looked back since then. It is still a family affair with three generations working in the front or back of the house everyday. As for popularity, you can see the parking lot full of cars seven days a week. In fact, the original lot was so full, Villa Nova eventually bought the lot and building next door (Just Pies) and turned it into a large lot just for the overflow traffic. The formula is, and has always been simple. 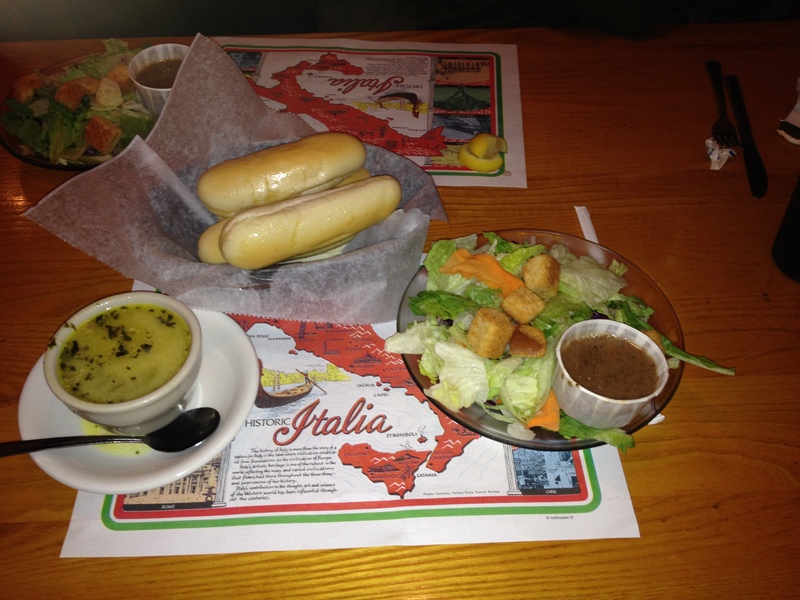 Offer Italian American Fare that is quick to serve and at a low to medium price point with no surprises. The food is basic, filling and comforting in large portions. Proximity to a large residential neighborhood and a retirement community don’t hurt business either. Of note, should you drop in is the extensive collection of pressure gauges and brass kettles numbering in the 100’s. One of the things that keeps people coming back are the daily specials. One special, which I believe has been a Sunday mainstay for 20 plus years. This was once a 1-4 times a month ritual for me. The only thing that has changed is a very slight change in price the meal is now $10.95 instead of the $8.95 of the early aughts. I’ll walk you through the Sunday Spaghetti Special. The special includes: your choice of soup either Italian Wedding or the soup of the day, a basket of bread sticks and a salad with your choice of dressing (I’d suggest the house Italian). 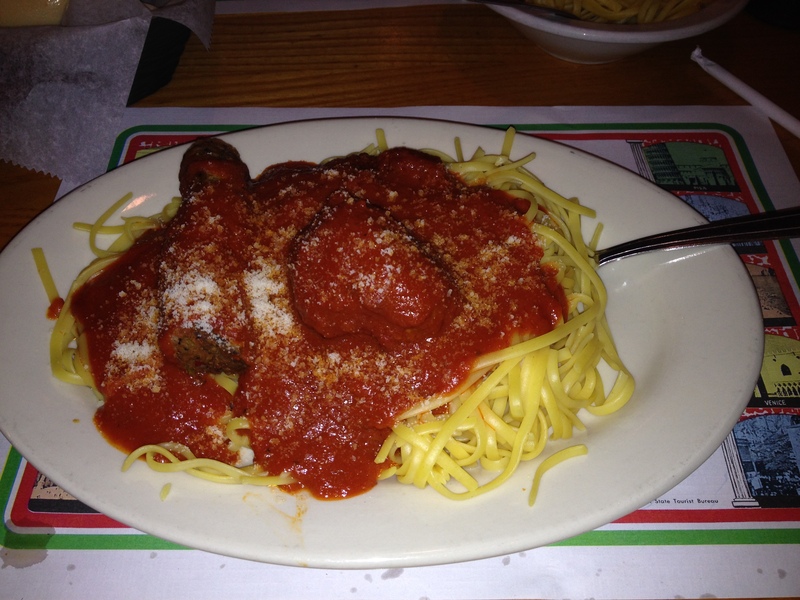 Then you receive a plate of spaghetti with one meatball and one Italian sausage served with plenty of thick, rich sauce on long, thick noodles. 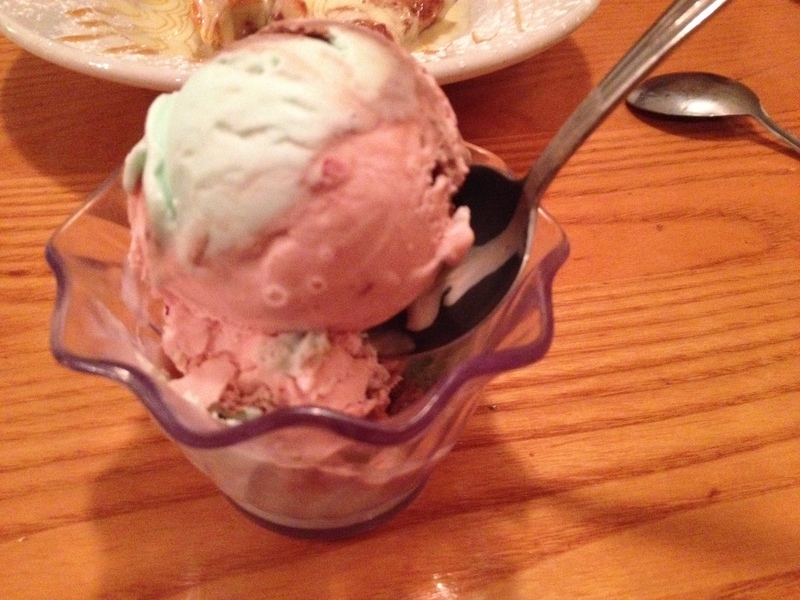 And then your meal is topped off with a cup of Spumoni ice cream. This entry was posted on September 1, 2014 at 9:14 AM	and is filed under bar, pizza, restaurants. Tagged: Villa Nova. You can follow any responses to this entry through the RSS 2.0 feed. You can leave a response, or trackback from your own site. Villa nova is a staple in our house too though we haven’t actually eaten there in years. I like it but I just don’t think it is good enough to justify the waiting times. Still, hardly a two week period goes by that we don’t order carry out at least once and sometimes twice. They do a great job on carry out and all of the items we’ve tried hold up really well. Even the fries that come with my favorite italian sausage sandwich stay crispy. My wife gets the same thing every time (Rigatoni and salad with house italian) whereas I tend to change it up with each order. In addition to the italian sausage sandwich, I like the lasagna and the chicken parm sandwich quite a bit. Even the fish is pretty good and a friend of ours swears by the luncheon steak (one of the few menu items I haven’t tried). However, i always advise people to stay away from anything with the Alfredo sauce. I just don’t think it is anything like any other alfredo sauce I’ve ever had and not in a good way.